OK, so he proposed, you said yes, you even agreed on the date, and now the fun part starts, organizing your wedding. At least it’s supposed to be fun, but when you’re faced with so many problems and decisions, from location to theme, design, flowers, plate sets, food dishes and a million other things, you suddenly realize that in order for your special day to be epic, there’s a ton of work to do. And since a huge part of both preparing the wedding and actually enjoying it is the people attending, pretty soon you’ll come to the conclusion that managing all the guests is undoubtedly the trickiest part. Fortunately we live in the era of the Internet, and many things that were expensive and required hard work are now at the touch of a button (or a few buttons, to be fair). All the hassle of getting invitations, personally addressing them to every guest, mailing them and then manually keeping track of who’s coming and who’s not, and even sharing the wedding photos after the ceremony can all be taken care of with a wedding site. you two are the stars, and you should keep it that way. A background story. Of course all your best friends and family will be there, but maybe not everyone knows the story of how you’ve met and fell in love. time it starts, its exact location, a map of the area to make it easier to get to, the menu and other things guests might find useful. Info about the best men and brides maids. Of course this is not a must-have like the others, but the bridesmaids and best men are an integral part of the ceremony, so the other guests would know who they are. A good idea would be to attach their Facebook profiles to your website. The picture gallery. Of course after the wedding you want to enjoy the honeymoon and the start of a new life, and maybe you don’t feel like getting a ton of requests from the guests regarding the wedding pictures. 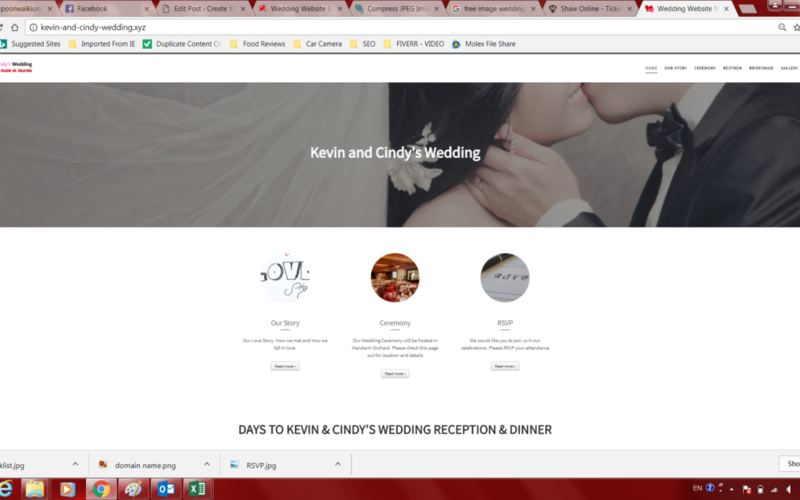 So posting them on the website that they already bookmarked before the ceremony is another crucial part of a wedding website design. Last but not least, the RSVP subpage. Never forget, this is the reason you created this website in the beginning: so people can easily get the invitation and confirm their attendance. So make sure it’s visible, as it’s your best tool for knowing who’s in and who’s not. Of course, your wedding website, as the ceremony itself, needs to be a reflection of the couple’s desires and imagination. Hopefully this post will make things easier for you, and the whole experience more pleasant for your guests.